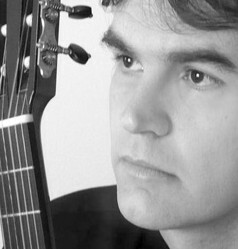 Michael O’Toole is one of the leading figures in the Irish guitar scene today. He has given many memorable solo recitals and also contributed significantly to the development of the instrument as Artistic Director of both The Waltons International Guitar Festival and The Chord Ennis International Music Festival. He has performed extensively at home and abroad and on national radio and television, His commitment to contemporary music and to the expansion of the guitar repertoire has led him to work with prominent Irish composers such as Eric Sweeney, Jerome de Bromhead, David Fennessy and Ian Wilson as well as international composers such as Clark Ross and Philip Glass. “…I was knocked out by his performances… he revealed a talent for telling stories with his hands and weaving meticulous trains of musical thought, delivered with a fair punch.” Tim Panting, Classical Guitar Magazine.